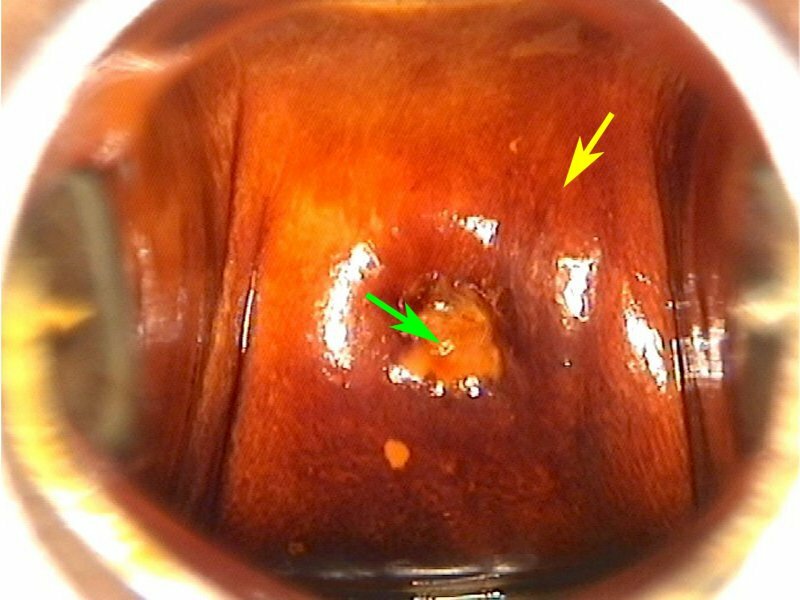 The original squamous epithelium is the native epithelium (which was present at birth) of the ectocervix. It is smooth and pink and does not change after application of acetic acid. 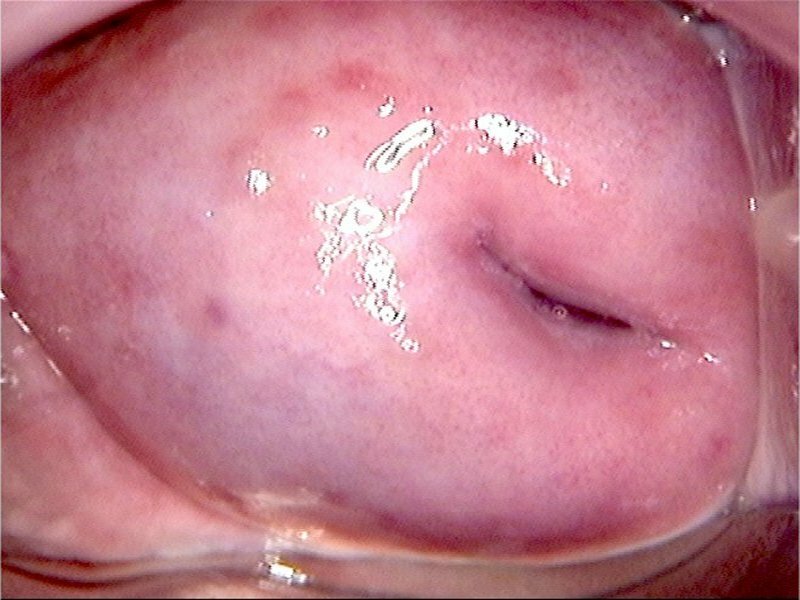 In a mature cervix, the original squamous epithelium is seen at the periphery and is continuous with the vaginal epithelium. The colour of the original squamous epithelium changes to dark mahogany brown after application of Lugol’s iodine, because of the staining of the intracellular glycogen in the superficial layers by iodine. Normal branching capillaries or hairpin like blood vessels are often seen over the original squamous epithelium. Microscopic features: The original squamous epithelium is made of stratified squamous epithelium that is non-keratinized. The cells of the superficial layer are flattened and devoid of nuclei or have very small pyknotic nuclei. The cells in the superficial and intermediate layers are rich in glycogen. The parabasal and basal layers have cells with bigger nuclei, and the cells are rounded in appearance. The epithelium is separated from the underlying stroma by the basement membrane. Note: The epithelium does not contain any blood vessels. Blood vessels are present in the stroma beneath the epithelium. 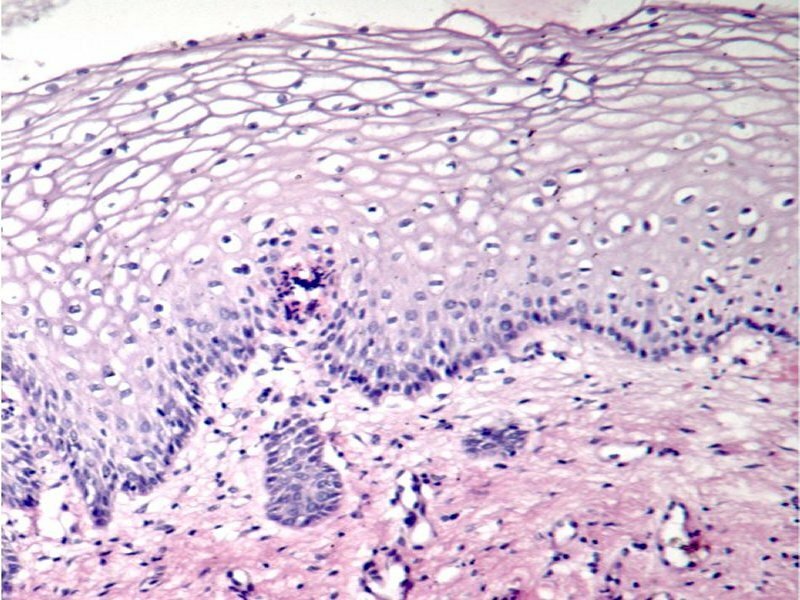 Normal mature squamous epithelium is usually thick and hides the blood vessels. Blood vessels are visible if they are prominent or if the epithelium is thin.